Today, we are reviewing one significant backend improvement offered by Amasty. Meet the Magento 2 Order Notes extension! As you already guessed, it is designed to improve the way your order grid looks and works. 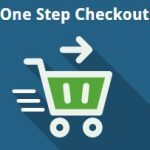 By default, the grid becomes more and more chaotic with each newly placed order, and Magento 2 doesn’t provide any tools for making it easier to use. But Amasty knows how to solve the problem, and below you will find core features of the extension as well as a tutorial to its backend usage. The Amasty Order Notes Magento 2 extension provides no influence on the frontend, but it essentially improves the default backend routine. The core aim of the module is the ability to highlight orders with flags and describe them with notes. Thus, managing orders takes much less time and effort, mainly due to the automated functionality of the tool: it allows assigning badges on the basis of the current order status adding an extra layer of priority recognition and clarity. It is even possible to apply several labels to one column. You only should create new additional columns where these labels will be displayed. 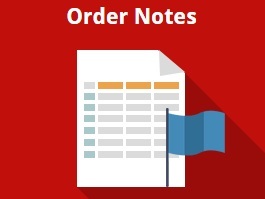 Prioritizing orders is also among the key Magento 2 order notes extension’s features. 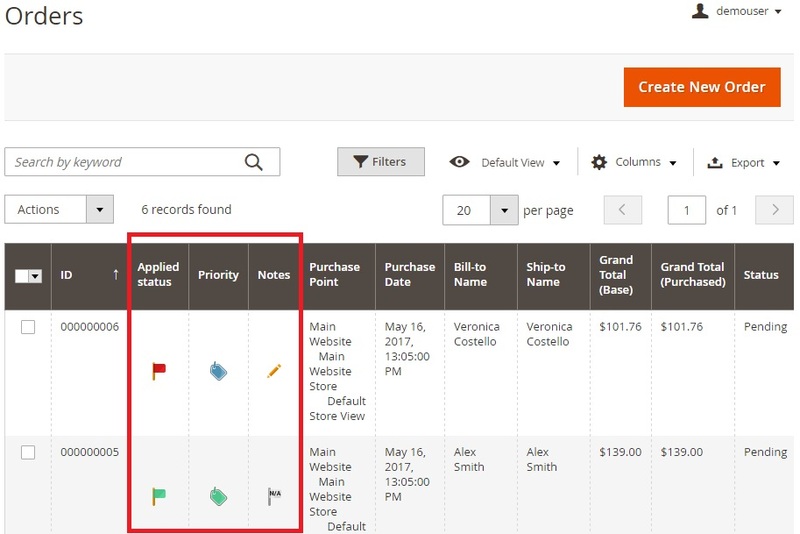 The Magento 2 module allows users to clearly identify order priority with flags. Thus, urgent orders will never be missed, and you will no longer have to spend much time looking for necessary orders. As for the automated actions, the Amasty Order Notes Magento 2 module provides the ability to set various flags for different statuses. For instance, “Suspected Fraud” may be highlighted by a red flag helping you avoid further problems. 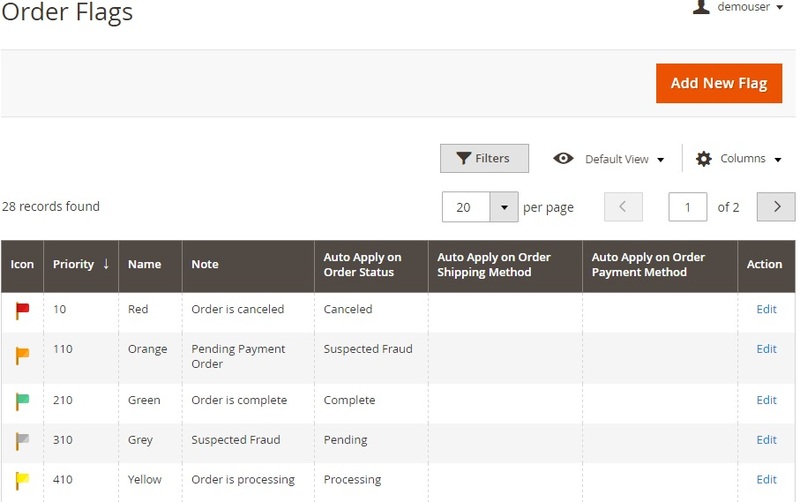 Shipping and payment methods may also be used as a basis for automatic flag assignment. Another improvement is related to mass actions. The Magento 2 order notes extension allows you to assign labels to multiple orders in just a few clicks. We will describe this process in the backend section below. The last feature we’d like to mention is a wide variety of flag options. 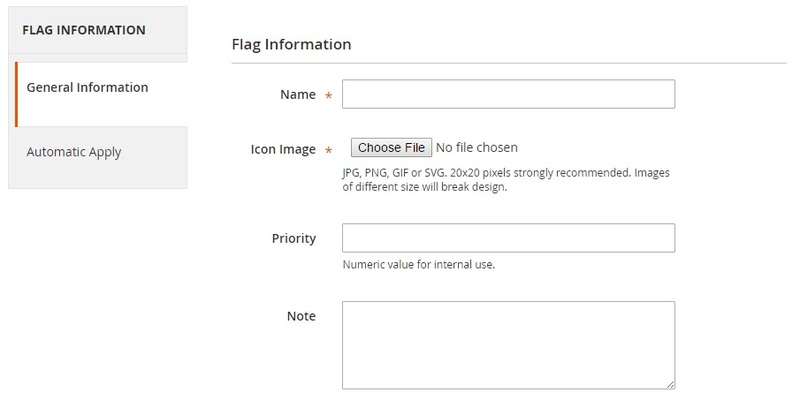 First of all, the Amasty Order Notes Magento 2 module allows you to use ready-made flags. If this is not enough, the Magento 2 order notes extension provides the ability to upload custom icons. Note that the amount of uploaded icons is unlimited. 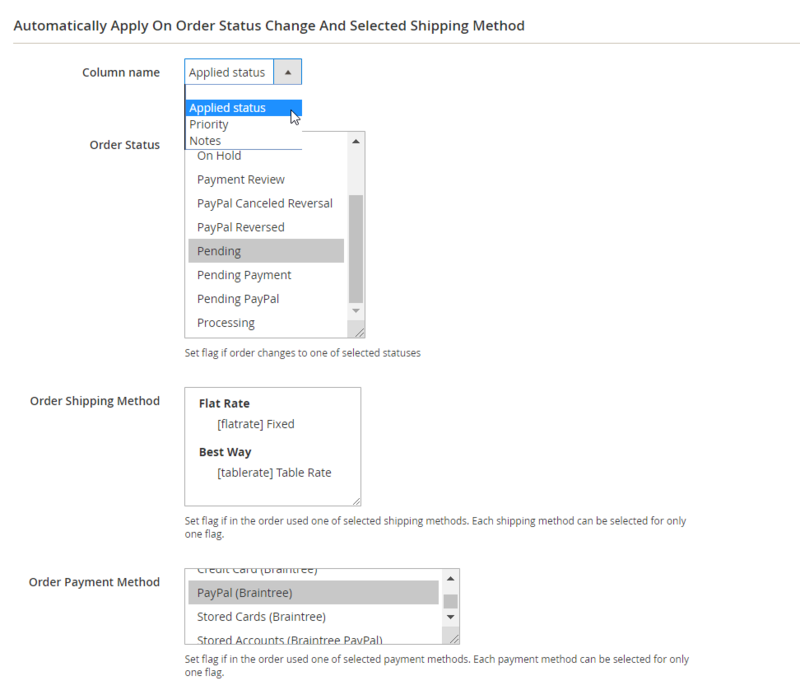 Auto Apply on Order Payment Method – a payment method for which the flag is applied automatically. 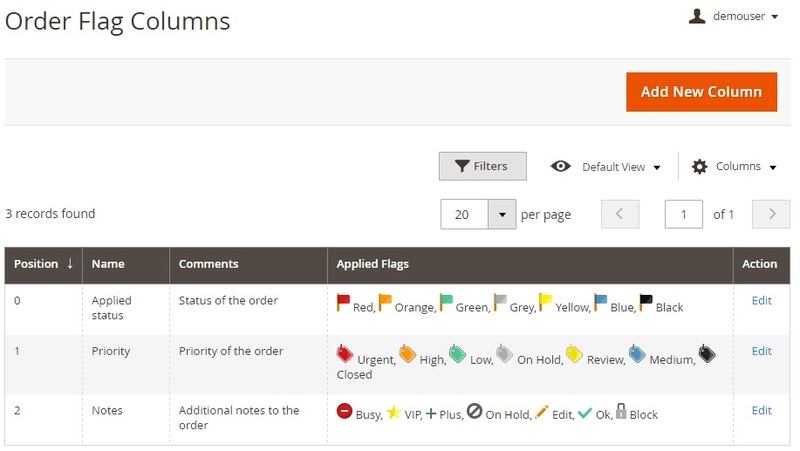 Due to the action column of the Magento 2 order notes extension, you can edit each flag individually. While adding a new flag, you have to deal with 2 tabs of settings: General Information and Automatic Apply. Type a flag name, upload an icon image, set priority (a higher value defines a higher priority for flags auto assigning), and create a note related to the flag. In the Automatic Apply tab of the Magento 2 order notes extension, select an order grid column where the flag will be displayed and specify order statuses, as well as shipping and payment methods to which it will be assigned. 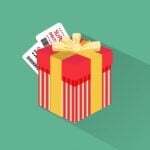 Note that each shipping and payment method can be selected for only one flag. 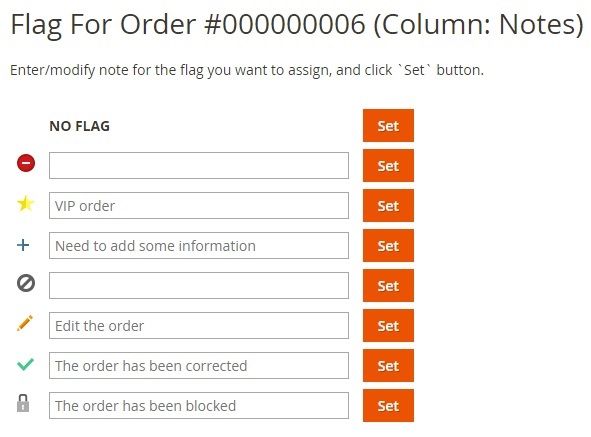 Now, let’s manage order flag columns used by the Magento 2 order notes module. Go to Sales -> Order Notes -> Columns. Here, you can see the position of each column, its name, comment, and applied flags. To add a new column with the Magento 2 order notes extension, you have to deal with two tabs of settings: General Information and Apply Flags. The first one requires to enter a column name, position, and comments. The second tab allows choosing flags that will be assigned to the column. Under Sales -> Operations -> Orders, you can see the mentioned above configurations in action. The Magento 2 order notes extension offers three columns: Applied Status, Priority, and Notes. For each column, there is an individual set of badges you can choose from to indicate certain order state. Click the order icon, and the Magento 2 order notes extension will display the window with available statuses. Here, you can select flags or other badges, as well as leave notes.